Banker, and member of the Piedmont Parliament; born in Nice; died at Paris February, 1856. He was a grandson of Isaac Samuel d'Avigdor, secretary of the Paris Sanhedrin; See Sanhedrin. He was the first Jew elected by his Catholic fellow-citizens to the lower house of Parliament, February, 1854. He was, however, at the same time also Prussian consul at Nice, and as such ineligible to Parliament; his election, therefore, was annulled by the house, but he was returned again by an overwhelming majority, and, having resigned the consulship. was admitted. 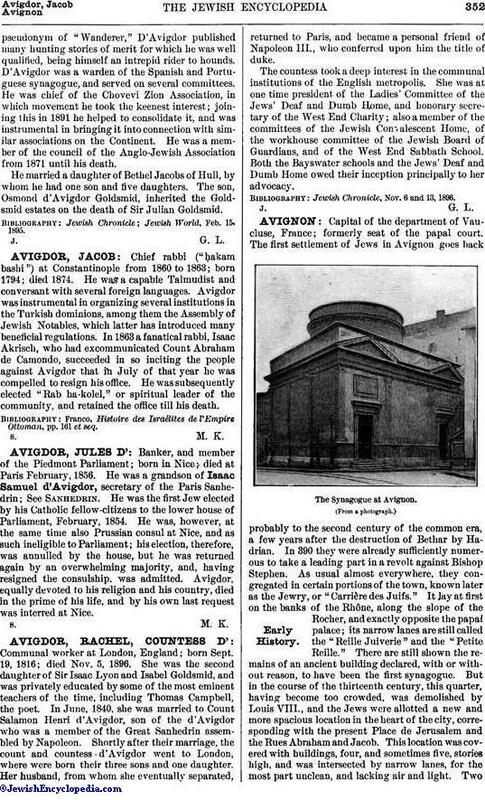 Avigdor, equally devoted to his religion and his country, died in the prime of his life, and by his own last request was interred at Nice.